A chick emerges from a fertile egg after twenty-one days of incubation. The germinal disc is visible on the surface of the yolk. 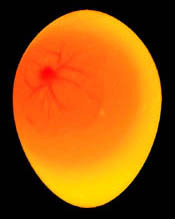 The development of the chick begins in the single cell formed by the union of two parental cells, egg and sperm, in the process known as fertilization. 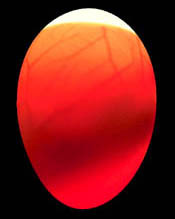 In birds, fertilization occurs about 24 hours before the egg is laid. The newly formed single cell begins to divide into 2, then 4, 8, 16, 32 and so on. At the time of laying, hundreds of cells are grouped in a small, whitish spot (the blastoderm or germinal disc) that is easily seen on the surface of the yolk. When the egg is laid and cools, division of the cells ceases. After the egg is laid, cooling the egg after the egg is laid does not result in the death of the embryo. It may resume its development after several days of rest if it is again heated by the hen or in an incubator. Special temporary organs or embryonic membranes forme within the egg, both to protect the embryo and to provide for its nutrition, respiration, and excretion. These organs include the yolk sac, amnion, and allantois. The yolk sac supplies food material to the embryo. The amnion, by enclosing the embryo, provides protection. The allantois serves as a respiratory organ, gets minerals from the shell, and handles waste. These temporary organs function within the egg until the time of hatching. On the twentieth day of incubation the embryo becomes a chick as it breaks into the air cell and starts breathing air for the first time. The chick emerges from the egg on the twenty-first day of incubation. Several changes take place during the 18th and 21st days. The chick draws what remains of the yolk into its body and "takes its lunch with it" (so-to-speak) when it hatches. Thus, the chick really doesn't need to be fed for the few days after it hatches. The chick's head is under its right wing with the tip of the beak pointed at the air shell. The large neck muscle contracts and forces the egg tooth through the air cell, and the chick takes it first breath. This is referred to as internal pipping. At this time, you may hear the chick peeping inside the shell. On the twenty-first day of incubation the chick finishes its escape from the shell. The egg tooth makes the initial break in the shell. This is referred to as external pipping. The hatching process can last from 4 to 12 hours before the chick breaks free from the shell. The chick, as it appears upon freeing itself from the shell, is wet and very tired. For the next several hours it will lie still and rest. A few hours later the chick, now dry and fluffy, will become extremely active and the egg tooth will dry and fall off.